The picture of an unknown woman has been included by the Moscow police in their evidence of the plan targeting John Helmer, which was carried out last December by Alfa Inform, a Moscow security company working for United Company Rusal. The name of Rusal, identified as the client on the title page of the Alfa Inform document found by the police, has vanished. A new title page appears in the evidence on the basis of which the Moscow police have recommended closing their criminal investigation. the police to the Moscow court now investigating the case. Pictures of the outer and interior entrances of Helmer’s building, lift doors, and a hand-drawn sketch of the space between Helmer’s apartment door, the building lift, and the fire stairs, have disappeared. Also missing from the evidence sent to the court are copies of false identification cards which the police seized from the Alfa Inform employees on December 28, and which the police showed Helmer during the identification and subsequent interrogations of those arrested. the dossier is signed by A.N. Yudenkov. On the judge’s order, the dossier was turned over for review and copying by Helmer’s lawyers. The court has been asked to decide whether a decision by the police not to indict the Alfa Inform agents, and those who engaged them, is warranted by the evidence, or should be returned for fresh investigation. A key piece of evidence in the case is officially confirmed as the Alfa Inform report on Helmer dated December 21, 2009 — a week before the arrests. The investigating detectives have also confirmed that the report was found on December 28 in the car occupied by armed employees of Alfa Inform led by Vladimir Sergeyevich Yakovchenko, when they were detained near Helmer’s office. Helmer had telephoned for police assistance after he had witnessed an attempt to enter his building and had recorded the men’s car number-plate. The names of Yakovchenko’s associates appear in the court file as Vasily Vladimirovich Sharendo and Denis Nikolaevich Khoroshev. In the records which they signed in the dossier, Yakovchenko and Sharendo said they were employees of Alfa Inform. Khoroshev’s evidence, noted down by the police and signed by him, was that he was not an Alfa Inform employee, but had been detained in the car with the others when he was trying to sell them a camera. Khoroshev described himself as unemployed. No evidence of the camera has been reported to the court, and there is no record of it in the protocol of investigation and inventory of the objects the police found in the year-old, blue Chevrolet Lanos car. This was carried out by the police investigator, R.V.Shubin. Shubin’s evidence reveals that the Alfa Inform report – first identified as 5 pages long, then corrected to 6 pages – was found in the car. A separate report, signed by police senior lieutenant A.N. Yudenkov, says Helmer was given this report during the interrogations of the Alfa Inform men. Without explaining why or how this happened, Yudenkov confirms that Helmer copied the first page of the Alfa Inform report. There are discrepancies between the police documents in the dossier. In their interrogations, all three men arrested by the police claimed that they had arranged to meet Khoroshev to buy his camera after they had been to Helmer’s address, and at a different location. However, the photograph of the car Helmer took when it was first spotted outside his building revealed all three men were together – Sharendo at the wheel, Khoroshev in the front seat beside him, and Yakovchenko in the back seat. The court file reveals that the men were arrested in the car between 1 o’clock and 1:30 pm on December 28. Witnesses of the arrest had their names taken at the scene. The men were then ordered to drive to the Khoroshevsky police headquarters nearby. The dossier records that they handed over to the police “belongings, telephone, and documents.” Copies of car registration documents and of the domestic passports of the three are in the dossier submitted to the court. Copies of the official credentials which Yakovchenko was carrying and which were examined by the police have vanished. Also vanished from the record is the gun Yakovchenko was carrying, according to the police who disclosed it to Helmer at the time. The interrogations at the police station lasted for four hours. But missing entirely from the dossier is a record of the questions Yakovchenko was asked about his first appearance at Helmer’s building the week before his arrest, on December 21. On that day, Yakovchenko had entered the building, taken the lift, and appeared at the security entrance of Helmer’s office, identifying himself, first as a militia officer, and then as an agent of the Federal Security Service (FSB). Meeting at the outer security door, Yakovchenko had shown a purported FSB pass to Tatiana Vasilievna Turitsyna, Helmer’s wife. When she saw him taking a photograph of her with a cell-phone lens, she closed the door, and alerted Helmer, who reported Yakovchenko’s visit to the FSB, and asked the FSB to verify his identity and credentials. The FSB has officially acknowledged in writing Helmer’s filing of December 21, and of a subsequent submission, dated January 10, in which Helmer requested the FSB to investigate records of the involvement in the affair of two current Rusal executives and a former high-level Rusal executive. On December 28, when Yakovchenko was under interrogation by detectives at the Khoroshevsky district headquarters, the police verified by telephone with the FSB that Yakovchenko was not an FSB senior lieutenant as his identification card suggested. That, and another of Yakovchenko’s cards, were shown to Turitsyna, who identified him as the man who had appeared at the office on December 21. An examination by the police of the cards revealed signs of forgery. This evidence, copies of the cards, and the record of contact between the police and the FSB are not included in the file submitted to Judge Gapushina’s court. An FSB report X-17353, dated February 2 and provided to Helmer, confirms that the FSB had investigated Yakovchenko’s credential, and confirmed that he “is not registered as an acting or former member of the FSB Russia”. 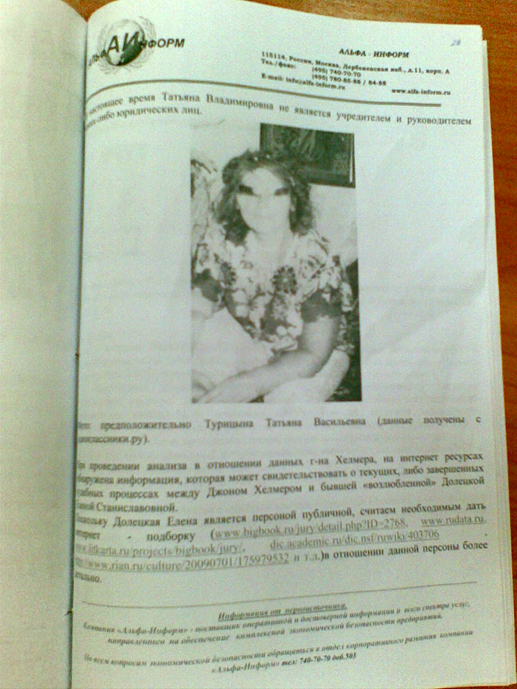 Turitsyna’s photograph appeared in the Alfa-Inform report to Rusal, and when the report was shown to her by the police on December 28, the photograph was recognized by her as the one Yakovchenko had taken the week before. The photograph which is now identified as that of Turitsyna in the report submitted to the Moscow court last week is plainly not of her; but the person who has been substituted is unrecognizable. 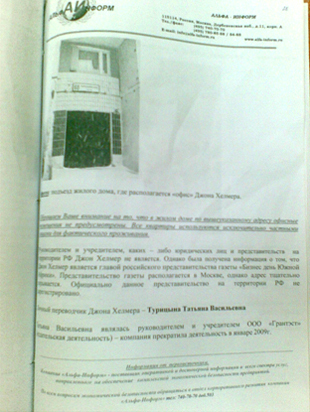 The original report page and the December 21 photograph of Turitsyna have vanished. The first page of the Alfa Inform report has also been changed from the original which was copied on December 28. The identification of Rusal as the client for whom Alfa Inform had prepared the report, has been removed. The original text has vanished, and new text put in its place. The original report says that “neighbours who live on the floor below” were also interviewed by Alfa Inform, and were quoted in the text. In response the next day, Helmer filed the message at the headquarters of the FSB, requesting that it investigate the nature of this security threat. Evidence compiled from Australian Government sources indicates that Australian officials had been tipped off earlier that the Alfa Inform security company had been engaged by Rusal to find Helmer’s physical whereabouts and despatch a group to meet him. The Australian Government official involved in Moscow, whose identity has been confirmed, then relayed the evidence to his superiors in Canberra, the Australian capital. There the report was reviewed by a high-level security committee comprising foreign ministry experts on Russia and intelligence officers. They ordered that Helmer be contacted and warned immediately. They also ordered that the evidence indicating Alfa Inform’s client and the source of the threat should be kept secret. Alfa Inform works regularly for the Australian Embassy to provide security for an annual trade show in Moscow; one of the sponsors of the show is Rusal. Rusal has investments in Australia worth more than half a billion Australian dollars, and is the principal buyer of Australian bauxite and alumina, feedstock for the production of aluminium. Oleg Deripaska, controlling shareholder and chief executive of Rusal, was in Australia last month for the first time since the December incidents. The Australian Government and BHP Billiton, Australia’s leading mining company, will not disclose what was discussed with Deripaska. A copy of the Australian Government security warning was also handed over to the Moscow police following the arrest of Yakovchenko and his associates. This copy appears in the police dossier received by the Moscow court last week. However, no Russian translation has been attached, and there is no indication that in their investigation of the Alfa Inform plan, the police arranged to have the Australian Government document translated into Russian, so that they could read it. The Moscow police detectives interviewing Helmer on December 28 had asked him what reason there might be for the security threat. They also asked what connection there might be between Australia and the alleged Russian threat. The detectives who then interrogated Yakovchenko told Helmer that Yakovchenko had made admissions about his instructions and the involvement of Rusal. Yakovchenko and his lawyer Igor Usanov, an employee of Alfa Inform, who arrived at the police station to secure Yakovchenko’s release, have subsequently said they did not intend to threaten or attack Helmer; that the pistol Yakovchenko carried was for self-defence; and that their purpose in investigating Helmer’s whereabouts, and attempting to approach him, was to invite him to undertake a public relations consultancy for Alfa Inform. Usanov made these claims in front of a group of detectives to Helmer and Turitsyna, when his remarks were recorded. At the time, UIsanov said his company had been commissioned by a client to investigate Helmer; he said he did not know who the client was. 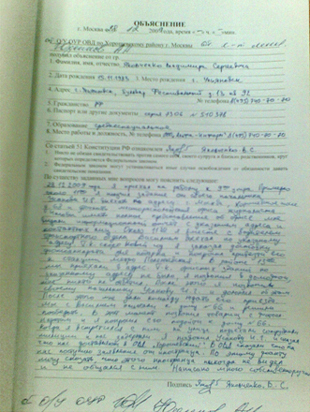 Usanov also signed a record of interview with the police. This has now been submitted in the case dossier to the court. There Usanov is identified as Yakovchenko’s boss, and the person who ordered him to go to Helmer’s address on December 28. “I gave the order to Yakovchenko to confirm the address, that this is the office of the journalist.” Usanov went on: “We were doing research on PR journalists to bring them to mutual work. We were planning to meet with him.” Usanov was not asked to explain why Yakovchenko had already been to Helmer’s office the week before, and what he was doing at the same address for the second time. 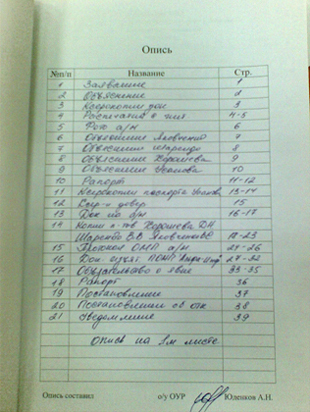 Usanov’s signed record also reveals that “guns or other forbidden [items]|” had been found on the men and taken by the police. Usanov had told Helmer they were legally registered and were intended for self-defence. In his recorded evidence, Usanov said the weapons “have not been given by Alfa Inform”. In the only document of Yakovchenko’s police interrogation now submitted to the court, Yakovchenko claims that he had been ordered to Helmer’s address on December 28 by Usanov. In this record he was not asked by the police why he was there for the second time in a week, why he was armed, and why he was carrying a false FSB pass. The evidence already in the hands of the FSB about Yakovchenko was ignored, at least in this version of the police interrogation of Yakovchenko. Rusal has told reporters investigating the affair that it had no involvement with Alfa Inform, or with the men who had visited Helmer’s office and photographed it, and who were then detained by the police. After the Moscow police had uncovered the Rusal connexion to Alfa Inform, and told Helmer, Helmer provided the names of three people associated at a high level with Rusal, who had made a direct approach to Helmer several weeks before the Canberra warning in December. The names and details were also provided to the FSB for follow-up. Among the details reported there were records of two meetings between the Rusal emissary and Helmer. These took place at the former’s request – the first on September 21 at the Barashka Restaurant in the Arbat quarter of Moscow; the second on September 25 at the Ararat Hotel in the centre of the city. The face-to-face meetings were followed by a telephone-call to Helmer on October 8. The record of what was said was not investigated by the police. There is no sign of these three names in the dossier sent to the court, nor is there any indication that the police conducted interviews with senior personnel at Alfa Inform or at Rusal. The names of the police officers who interrogated Yakovchenko and his associates, discovered the Alfa Inform report, and questioned Helmer are not the same as the officers who prepared the dossier and signed the submission to the court. The investigator who interviewed Helmer was Yu.Yu. Mosyakov. The officer who examined the car was R.V. Shubin. The case officer in charge, who was identified to Helmer and to the US Embassy the next day, and who spoke by telephone to US consular officials representing Helmer, was Vladimir Bolovniev. But a different officer, A.N. Yudenkov, appears in the dossier as the interrogator of the arrested men and the Alfa Inform representative, Usanov. Yudenkov also signs a report, dated January 4, in which he claims to have made several telephone calls to Helmer for follow-up. According to this report, Yudenkov says “Helmer refused to meet”. No record of these communications or evidence of the alleged refusal has been submitted to the court. On December 30, Helmer sent the US Embassy in Moscow a note discussing how best to arrange to meet with Bolovniev. In subsequent discussions with the US Embassy, it was reported that Bolovniev was not answering his office or mobile telephone number. In a separate conversation with a US Embassy official, Bolovniev had refused to meet Helmer at the Embassy where Helmer had requested consular security protection instead of the police station. 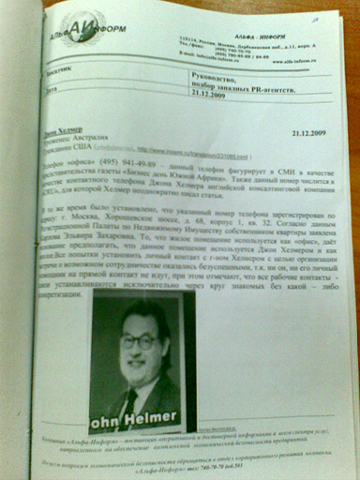 Helmer’s concern with his security was founded, not only on the intelligence warning he had already received, but on the police evidence that Yakovchenko had been armed when he had attempted to enter Helmer’s building on December 28, and that the Alfa Inform report had included an apparent ambush diagram darwn on the back of the final page. The dossier filed by the police to the court includes no inventory listing of Yakovchenko’s gun. Three receipts, signed by Yakovchenko, Sharendo, and Khoroshev, are in the file. They say that each individual had received back from the police “belongings, telephone and documents”. Yakovchenko’s gun is not identified. Neither is Khoroshev’s camera, the sale of which was his purported reason for meeting the others. The receipt signed by Yakovchenko reveals an unusual discrepancy. If the dossier provided to the court is genuine, Yakovchenko had told his interrogator Yudenkov that he was living at Boulevard Festivalny, House 13, Apartment 92, in Ulyanovsk. 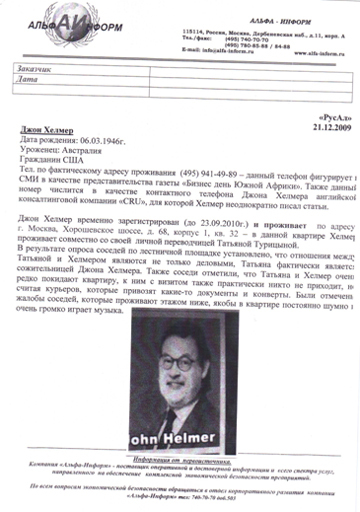 The telephone number he gave, according to Yudenkov’s record, was that of Alfa Inform’s Moscow office. Several hours later, when the interrogation had been completed, and after Yudenkov and Yakovchenko had ostensibly signed the record, Yakovchenko filled out in his own hand a receipt for return of his belongings. This time, he said his address was Kalinin settlement, House 13, Apartment 12, at Lyubertsy, a town outside Moscow. The telephone number he gave this time was that of a personal Moscow mobile. Yakovchenko’s sudden change of address is not the only sign that the initial evidence gathered in the police investigation may have subsequently been changed, before it was sent to the court.